SaaS Marketing Is Different. Here’s How to Do It Well. Becca is a Content Marketing Writer at Codeless, fueled equally by caffeine and seventies jams. Her work has been featured in Adweek, Business Insider, Forbes, and more. Creating an effective SaaS marketing strategy isn’t easy. While more traditional companies can follow more traditional methods for achieving steady business growth, SaaS brands follow a very different business model — and they need very different marketing strategies to match. Fortunately, plenty of successful SaaS companies have already developed methods for reaching and converting customers. So if you haven’t yet found an approach that works for your brand, there’s no need to reinvent the wheel. 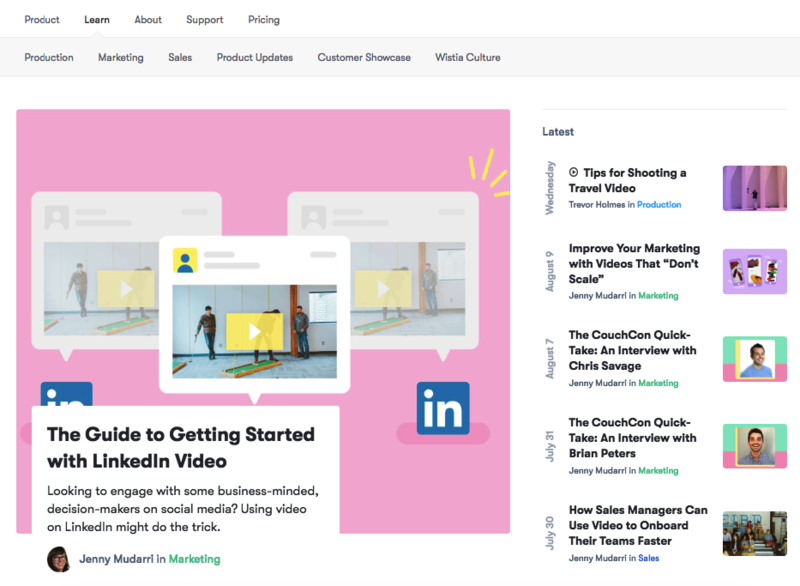 Instead, keep reading to learn what makes SaaS marketing so uniquely challenging, as well as five tactics you can use to overcome those challenges. Is SaaS Marketing Really Any Different? The most obvious difference between SaaS businesses and traditional product-based businesses is that software isn’t a tangible item in the same way. Plus, convincing a user that your tool deserves to be an integral part of their daily routine tends to be a more difficult task than persuading a shopper to buy a t-shirt. But beyond that, is marketing a digital product that much different than selling a physical one? While many retailers generate revenue even from single, one-time purchases, the SaaS model relies much more heavily on ongoing subscriptions. And while marketers at more traditional companies tend to focus primarily on the acquisition, that would be a huge mistake for any SaaS company. 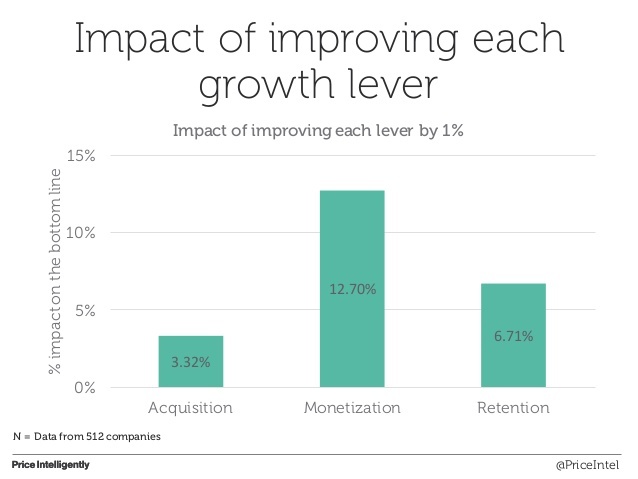 An analysis from Price Intelligently found that when comparing the relative impact of 1% improvements in each of these three stages, monetization and retention both had much more significant impacts than acquisition. So while earning new customers may have a clearer impact on growth, it’s certainly no more important than the subsequent steps in the process. And any SaaS marketing strategy needs to take all three into account to be effective. If your current approach to earning and retaining customers for your SaaS business isn’t getting the results you want (or you haven’t yet created one at all), you’re in the right place. You can use the following five steps as a rough SaaS marketing plan for your business, and be confident that your approach takes all three stages into account. Most SaaS companies know by now that content marketing is one of the best ways to earn new users. Square, QuickBooks, and Wave all have resources readily available to help searchers achieve their goal. And it should come as no surprise that each of them is optimized to convert those searchers into leads for their business. After all, this is the primary goal of most content marketing strategies. If you’re not yet familiar with how, exactly, this tactic works, Bryan Harris’ approach to building an audience for VideoFruit is a perfect example. First, he added a blog to the company’s website. 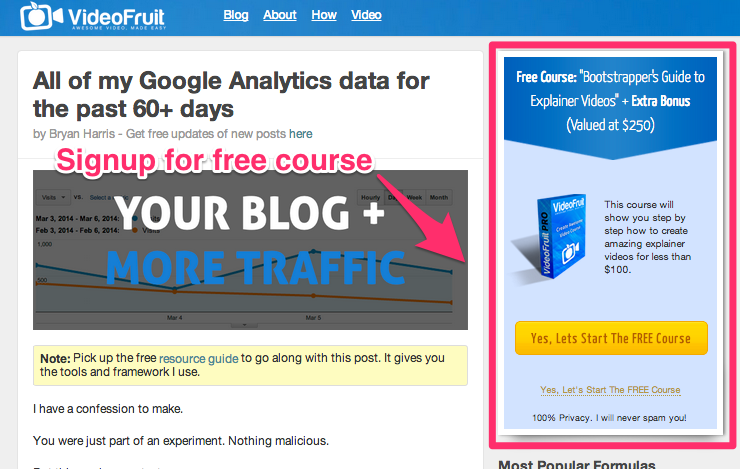 Then, he created a free course and added it as a content “upgrade” in the blog’s sidebar. In exchange for their email addresses, readers could gain free access to this resource (“Valued at $250”!) that would tell them how to create explainer videos for under $100. And within the first 30 days, he earned 107 subscribers. It’s no wonder, then, that content is such a popular strategy among SaaS marketers. And now, many of them are stepping up their game by experimenting with new formats and ways to attract attention. 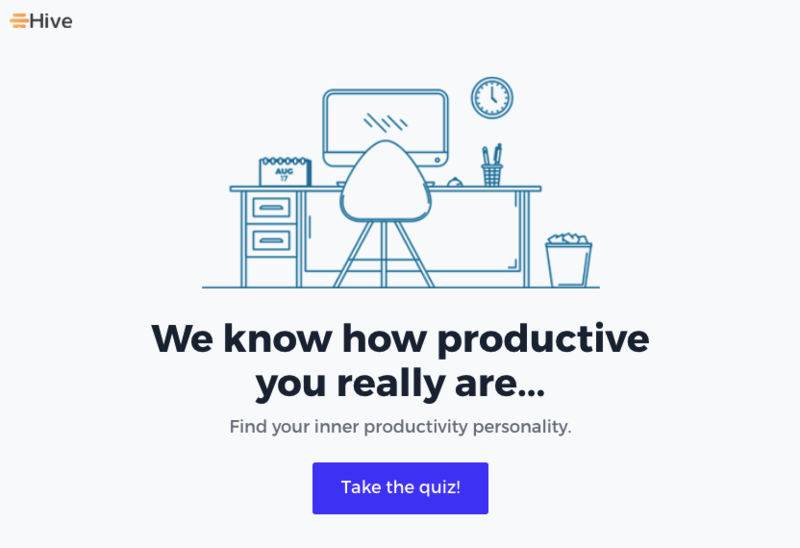 For example, productivity-focused project management platform Hive created a Productivity Styles quiz that tells users more about their work styles. This is likely much more engaging for the majority of visitors than even the most well-written blog post on the subject. 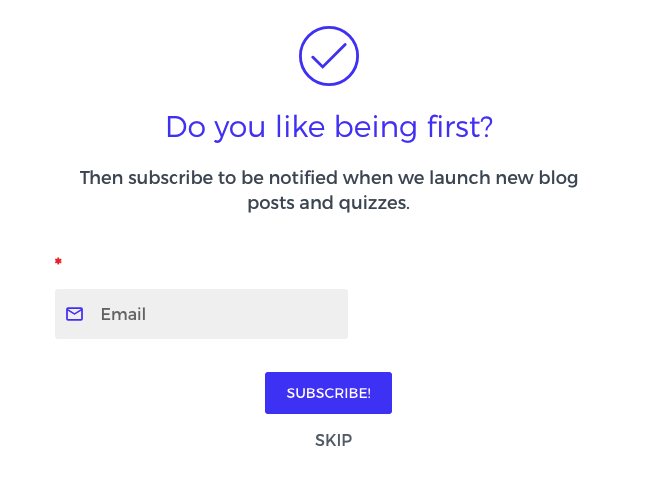 Of course, visitors can still see their results whether they subscribe or not — but if they enjoyed taking the quiz, this prompt might be all it takes to turn them into a lead for Hive. And the fact that brands are now bringing this level of creativity to their content strategies is great news for consumers, as it means that the overall standard of quality is improving. But it also means that if you want this strategy to work for your company, it will take more than merely publishing a blog post every few weeks. Now that virtually every SaaS brand in existence is creating it, “good” content is no longer good enough — and to get the results you want, you need to be willing to put in the time it takes to find unique angles for your brand. That said, one content format that’s proven to be effective across the board is the case study. And when I say “effective,” I don’t just mean in terms of their ability to attract traffic. One study found that when compared to other forms of customer stories and testimonials, respondents were much more likely to be willing to pay for a product after reading a case study. 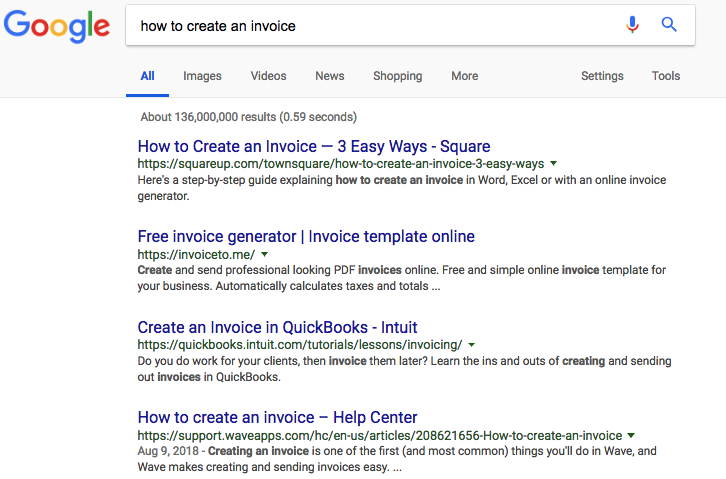 So if you’re looking to improve your results in the monetization stage, the answer as to what kind of content you should be creating is fairly clear. Take a look at your user base, identify customers who’ve experienced positive results from using your product, and ask if they’re willing to be subjects for a case study. Then, combine data illustrating their success with some background information on their company and goals — and you just might have a winning piece of content on your hands. Finally, it’s important to note that content can also be used to boost your results in the retention stage. Video platform Wistia’s Learn section is a prime example of this. The company has essentially dedicated an entire section of their website to tutorials on every part of the video creation process, from coming up with video ideas to improving video quality. And it doesn’t take too much critical thinking to see how encouraging users to invest in video might be beneficial for a video hosting platform. So if you’re struggling to get results with content, consider which stage in your marketing strategy needs the most work. Determine what needs your target audience has in that stage, and focus your content efforts on addressing them. The ability to offer free trials is one advantage that SaaS companies have over those with a more traditional business model. A furniture store, for example, couldn’t just give all prospective buyers a free couch to try for 30 days — at least not without running into a logistical nightmare at the end of that trial period. For SaaS companies, this process is much easier. There’s nothing to return at the end of a trial, whether a user decides to move forward with a paid plan or not. This means that there’s a relatively low barrier to entry — and you should highlight this by featuring a trial offer prominently throughout your marketing materials. 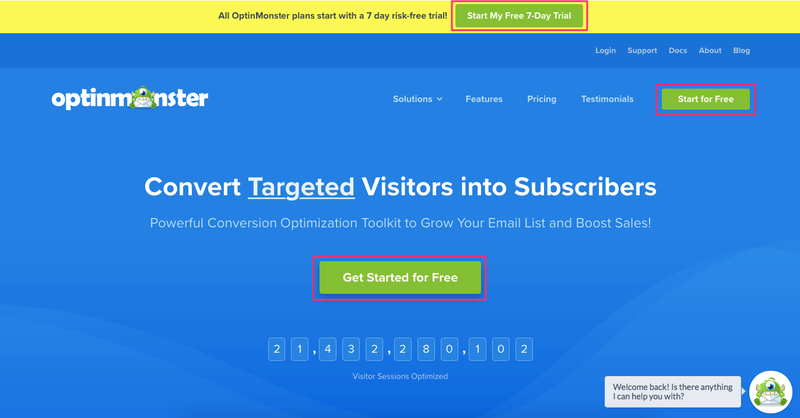 For example, take a look at OptinMonster’s homepage. That’s three free trial CTAs above the fold alone. And as you build your list of email subscribers, you can also include trial offers in your email content, like Evernote does every time they announce a new feature. After all, building a list is only beneficial for your company if your subscribers eventually try out your product — so it’s in your best interest to regularly remind them of just how easy it is to do so. During the acquisition stage, getting a user to sign up for a free trial is only half the battle. The other half is getting them to actually use your software. But that doesn’t just mean sending an email every few days to remind trial users how much time they have left. Instead, you can take a strategic approach by determining which actions drive trial users to become paying customers. 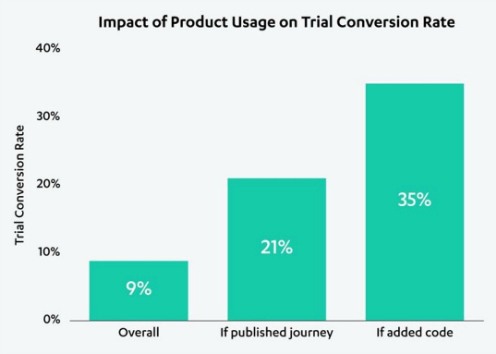 For example, Autopilot found that while only 9% of their total free users became paying customers at the end of their trial, that percentage jumped to 21% for users who’d published a journey, and 35% who’d added a tracking code. And while the exact actions are different for every product, you need to determine what they are for yours — then create a strategy for encouraging users to take those actions. 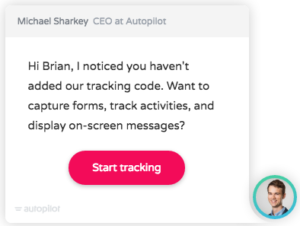 Autopilot, for example, created in-app prompts instructing trial users to complete the steps they’d identified as having the strongest correlation with conversions to paid subscriptions. But if you’re interested in SaaS marketing automation, this is the perfect place to incorporate it. 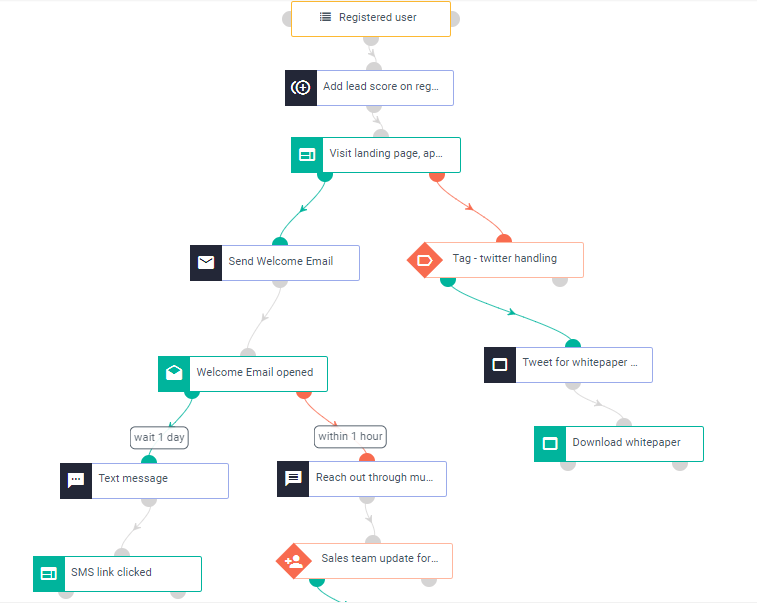 Automated email campaigns, like this one from Aritic, are an excellent way to deliver relevant content to trial users, tailored to where they are in the activation process. Each email is based on the actions a user has (and hasn’t) already taken, to maximize their usage of a product during the trial period. The goal here is that each user will become as familiar with your product as possible while it’s free. Then, at the end of the trial, they’ll know exactly what they stand to gain by becoming a paid subscriber — and what they’ll be missing out on if they don’t. If you’re used to a more traditional sales model, pricing may not seem like a marketing strategy — because, in the context of more traditional businesses, they have very little to do with one another. But within the SaaS model, they go hand in hand. Getting trial users to convert into paying customers is a huge part of SaaS marketing, and pricing plays a significant role in this process. 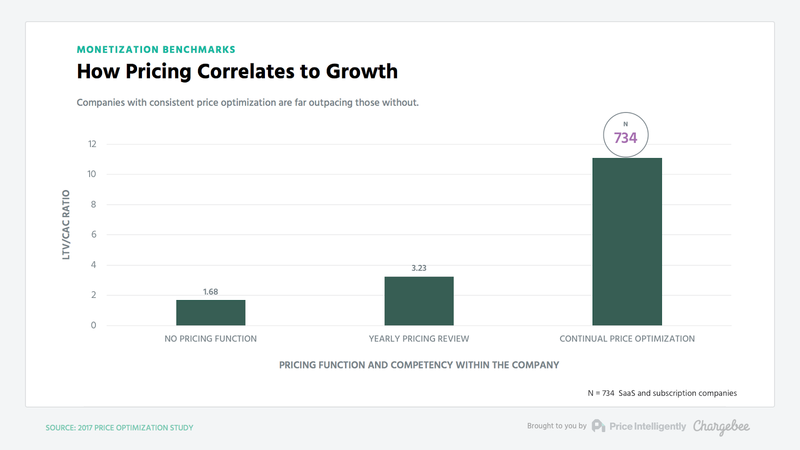 One study found that companies that consistently optimize their pricing have six times the LTV/CAC ratio of those who don’t. Pricing models can also play a role in establishing a steady flow of revenue for your business. Expansion revenue makes up less than 10% of monthly revenue for subscription-based companies — meaning that your success ultimately depends on your ability to generate ongoing subscriptions. And from a cash flow standpoint, getting customers to sign up with an annual agreement is the best-case scenario. But you’ll want to run a few experiments to figure out the best way to offer these agreements to your customers — because the most effective approach isn’t always the most obvious one. For example, because most consumers don’t naturally understand percentages, they’re more likely to take advantage of an offer that gives them something for “free,” instead of one with a percent discount. So if you’re trying to get users to switch from a monthly plan to an annual, offering a “free month” may be more effective than a 10% discount — even though the second is technically a better deal. Though this may seem like a minor semantic difference, even a small increase in conversions could have a major impact on your ability to earn valuable subscriptions. And considering that each of those subscriptions can translate directly into revenue, it should go without saying that the time it takes to run a few experiments is more than worth the payoff. Most marketers are well aware of the value of referrals. Considering that 82% of Americans seek recommendations from friends and family when considering a purchase, it’s safe to say that a positive review from a trustworthy source can go a long way in shaping a prospective buyer’s view of your brand. But getting even the happiest of customers to tell others about your brand isn’t exactly easy. So to make this a viable marketing strategy for your business, you need to offer your users something in return. For example, you may have heard the impressive story of how Dropbox grew their user base from 100,000 users to over 4,000,000 in 15 months by offering users 16GB of free storage in exchange for referrals. And even if giving away certain features for free doesn’t make sense for your product, this is still a strategy you can use for your brand. 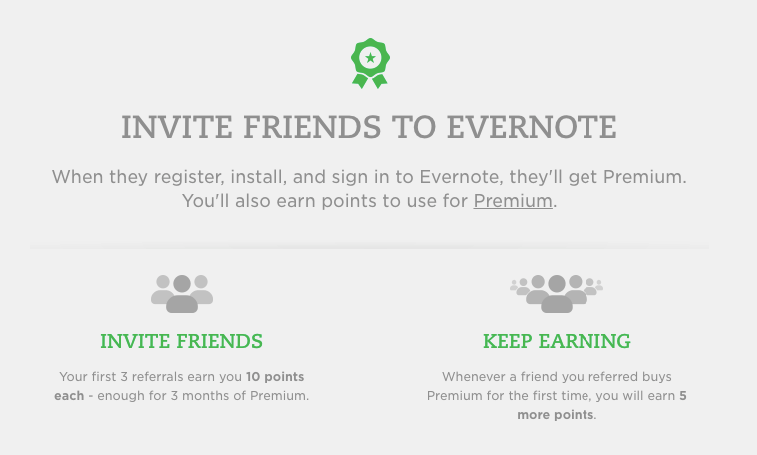 Evernote, for example, centers their referral program on giving users “points” they can use toward their subscription costs. 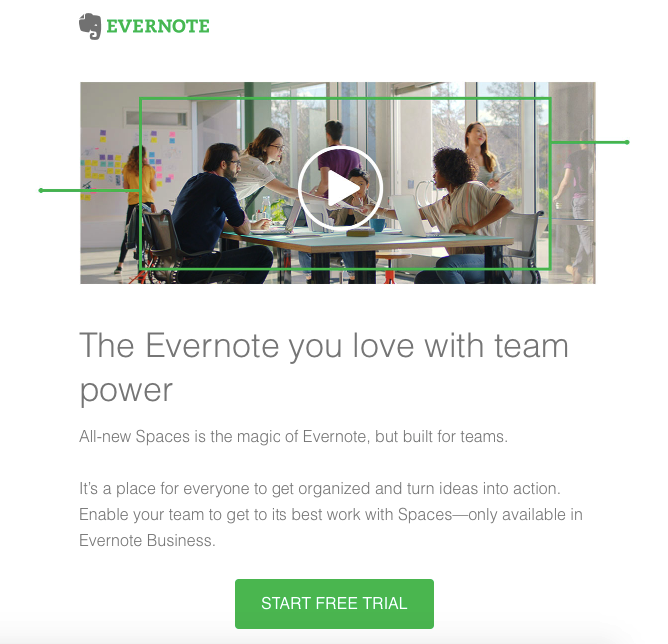 For every three friends a user refers, they get three free months of Evernote Premium. With this strategy, the brand essentially incentivizes referrals with their own product — making it a win for both acquisition and retention. And beyond the standard referral model, many businesses have also developed their own affiliate marketing programs to earn new users. 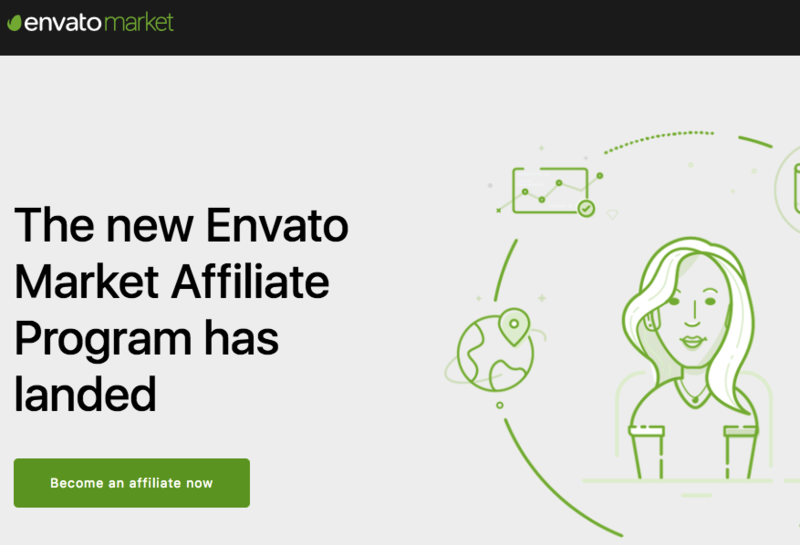 Envato Market’s affiliate program essentially makes users an extension of their sales team by offering them a 30% commission on the first purchase a referred user makes. Of course, the best referral model for your business depends on both your product and your marketing budget. But as long as you’re able to build a user base of happy customers, and you offer something of clear value in exchange for their recommendations, this has the potential to be an extremely powerful addition to your marketing strategy. At its core, SaaS marketing is still marketing. In practice, it can look very different from anything a traditional marketer is accustomed to. But when it comes down to it, the most critical factor in your strategy’s success is whether it effectively addresses all three parts of the SaaS sales cycle. If your approaches to acquisition and monetization are strong, but your retention efforts fall short, you’re unlikely to see the results you want. And the same holds true for any other stage in the process. But if you’re willing to invest the time it takes to create unique strategies for each, achieving steady growth is entirely possible — making that investment more than worth it for your business. 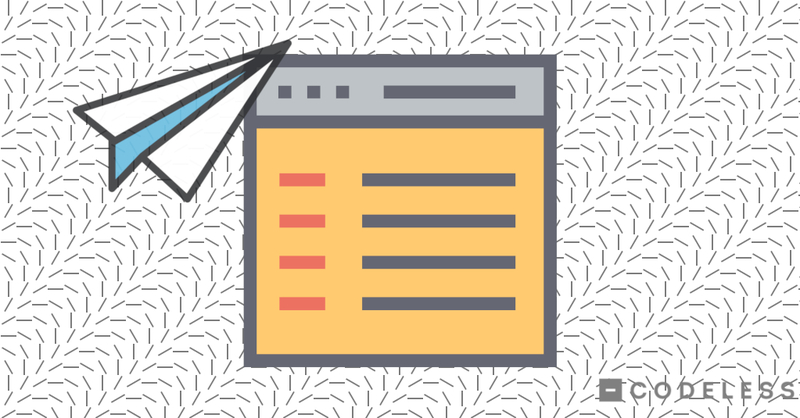 The Content Farm Olympics: We Bought & Tested 5 Content Writing Services. Here are the Results. Codeless, Proudly powered by WordPress.